A chic handbag can upgrade virtually any ensemble. Truthfully, it could very well upgrade you (to fashionable status). I know it sounds like a lot for one accessory to accomplish, but it's the truth. And you don't even have to break the bank. 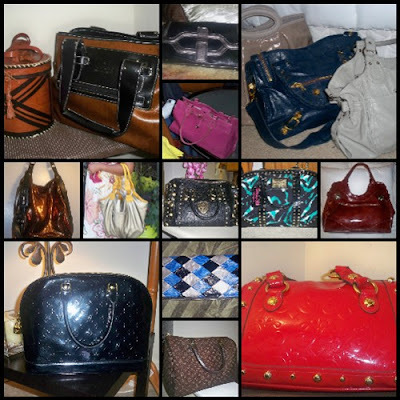 One glaring misconception about purses is that labels are most important for quality and stylishness. I am a fan of Louis Vuitton, but I much more fancy beautiful handbags -- across all genres -- than the ideal of just one style or brand. I do realize that I'm more the exception than the rule when it comes to handbags. But, I'm all about the basics in finding what I like. And since I'm always talking with people about my love for purses, I thought I'd share some of my tips to handbag shopping and favorite online purse pages. When searching for your next handbag, remember these tips and you're sure to make the perfect purchase. 1. Keep your eyes open. I've found handbags that I love at Wal-mart as well as in the clearance bin at an unassuming second-hand store. You don't have to be in a department store or designer boutique to find your new "It" bag. 2. Switch things up. Have fun with different shapes, styles, sizes and handles. Don't let "functionality" lull you into never having the right handbag when you want to look extra special. 3. Be daring with colors. Thank goodness designers like Coach and Dooney & Burke wooed us out of the black and brown purse doldrum. Why not build an outfit around your purse for a change? 4. Buy quality. Ill-made purses fall apart (cracking straps, malfunctioning fasteners, discoloration) very quickly and by the time you replace a couple, you'll have paid for one that you considered too pricey. Make quality about the material and not the price. TJMaxx is great for this. 5. Invest in at least one special occasion (and even everyday) clutch. There's nothing worse than lugging a big purse around when you're dressed up for a formal event. And everyday clutches are so conveniently fashionable that you'll be glad to grab it when you're on the go. *Bonus tip: If you're a fan of Coach, find the nearest Coach outlet and treat yourself to one of their timeless bags for what could, on any given day, be as low as $79. Their every-day prices are unbelievably low. Thanks for the post - great insight :-)!!! How to you find the time to switch them out - that's my dilemma. I have several just sitting on the shelf because it feels like too much of a "chore" to switch them out. This is my wacky confession of the day, but I generally build my clothing choices each day around the purse that I want to carry. So, changing doesn't even phase me. I've always been that way about handbags.